When the battery needs renewing, there will be a significant decrease in the effective range and the message SMART KEY BATTERY LOW will be displayed in the message centre. To renew the battery: 1. Slide open the side cover. 2. 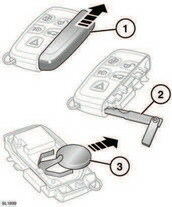 Remove the emergency key and fit into the receiver. 3. With the key unfolded, twist it to split the Smart Key case open. 4. Remove the old battery and fit a new CR2032 type battery (available from your Dealer), with the positive (+) side upwards. Note: Avoid touching the new battery, as moisture/oil from fingers can reduce battery life and corrode the contacts. Refit the parts in reverse order, ensuring that they click securely into place. Battery disposal: Used batteries must be disposed of correctly, as they contain harmful substances. Seek advice on disposal from your Dealer and/or your local authority.